Southwestern homes combine the best of colonial and traditional pueblo architectural elements. You’ll find them with stucco finishes and stone accents. Most often they’ll have a flat or tile roof. Adobe homes, also referred to as territorial, are rustic, stucco-surfaced homes that incorporate elements such as courtyards. They are often painted to blend into the landscape and almost always have flat roofs. Ranch style homes are always popular because of their simplicity and open floorplans. They are also easier to keep cool in hot Arizona summers. Depending on the exterior style, ranch homes have tile roofs as often as shingle roofs. Spanish colonial, mediterranean, and tuscan style homes are also very popular in the Arizona desert. In addition to almost exclusively having tile roofs, the exteriors are typically stucco finished in muted colors that match their surroundings. Depending on your preferred style, your roof options may be limited. You wouldn’t want to put a shingle roof on an Adobe home for instance. Well, maybe you would, but we wouldn’t. We don’t think your neighbors would be very happy with the choice either. 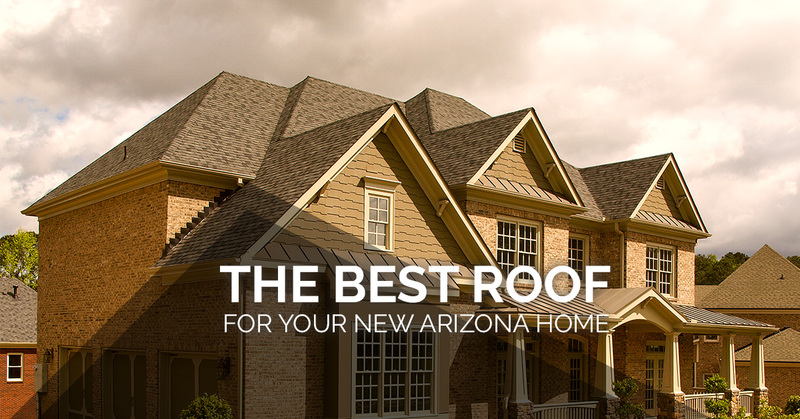 Whichever you choose, here are the ins-and-outs of installing, maintaining and replacing each type of the most common Arizona roofs. If you are planning to build a ranch home, or a modern multi-story home, a shingle roof might be an excellent choice. They are very durable, can be quickly installed and stand up well to the elements. If the style of choice you’ve chosen lends itself to the aesthetics of a shingle roof, you may want to make it your choice so you can spend some extra budget on other amenities like landscaping or a pool. If you choose a shingle roof, make sure that your contractor is sufficiently experienced. An experienced roofer will know that improper attic ventilation can dramatically reduce the life of your shingle roof. They will know which type of shingles to recommend for your particular climate. In the desert, where temperatures can vary dramatically, certain types of shingle roofs are going to fare much better than others. The last thing you may want to consider is that most types of roofing shingles are not very environmentally friendly. They are usually petroleum based and cannot be recycled or repurposed like tile shingles. There is no way around the fact that tile roofs are more expensive. They can sometimes cost twice as much as a traditional asphalt shingle roof. We think that most of the time a tile roof is worth the extra upfront expense. In addition to being a beautiful addition to your home, there are a lot of other benefits. Even in the Arizona desert, with proper installation and care, a tile roof can last 100 years. Most manufacturers offer a 50 year warranty, but with modern tiles built to withstand hail, punishing sun, and heavy winds, you will likely never have to worry about a warranty. In addition to being virtually maintenance free, tile roofs also help keep your Arizona home cooler in the blazing sun and are completely impervious to pests. If you choose a tile roof, hiring an experienced professional roofer becomes the most critical factor in your long-term satisfaction with your decision. For all of their benefits, if a tile roof is improperly installed, the consequences including leaks and structural damage, can be disastrous. Tile roofs can weigh up to four times more per square foot than traditional asphalt shingles. You’ll need to take that into account when putting the structural supports in your new home. They are fragile and easily broken during installation. They are also not appropriate for very low pitched roofs. Be sure your architect, builder and roofer all understand these important factors. The professionals at Express Roofing have been installing tile roofs for almost two decades. We know what we’re doing. The two most popular flat roof systems in Arizona are foam and modified bitumen (asphalt) roofs. Here at Express Roofing, we are experts at installing both types. Here are some pros and cons to consider. When installed properly, modified bitumen roofs are watertight and extremely UV resistant. Installation is fast and efficient. They do a good job of preventing pooling water and provide a double layer of protection against the elements. Foam roofs provide a flexible, seamless surface that contracts and expands with changing humidity and temperature. Its reflective properties also provide passive cooling for your building. Foam roofs are most often used on commercial buildings but are gaining popularity in the residential market. Give us a call if you’d like to learn more about this option. We’re pretty sure that if you’ve gotten to this point in the article, that you realize choosing the right roofer for your new home is critical to your overall satisfaction, safety and enjoyment of your new home. You can rest assured, should you choose to work with Express Roofing, which we hope you will, that you will be 100% satisfied with our work and our outstanding customer service. Give us a call today. We look forward to hearing from you.